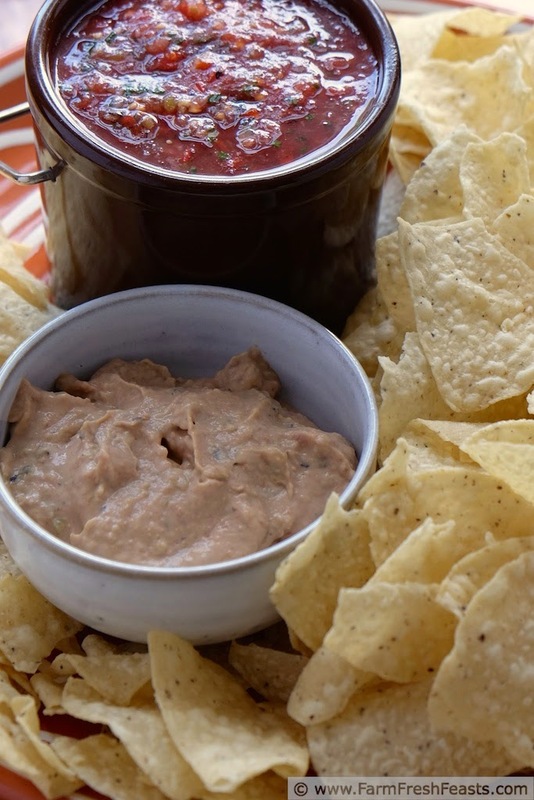 Three ingredients and a minute of preparation results in a spicy yet creamy Hatch Chile and Refried Bean dip. This is nice paired with chips and salsa. Last minute three ingredient appetizer recipes are NOT something I'm good at. I usually roast a vegetable (like this link to a sriracha butternut squash hummus) from the Community Supported Agriculture (CSA) farm share prior to processing it into a dip or layering it with other vegetables and cheese (like this link to avocado feta hummus) before serving. It's not terribly difficult, but it's got some steps. Not this time. Not this dip. I'd just whipped up a batch of fresh salsa using some roasted Hatch chiles and the pile of paste tomatoes from the garden [it worked fine, and was less runny than I'd expect for a fresh cantina style salsa--no recipe though] and I wanted a creamy counterpart. 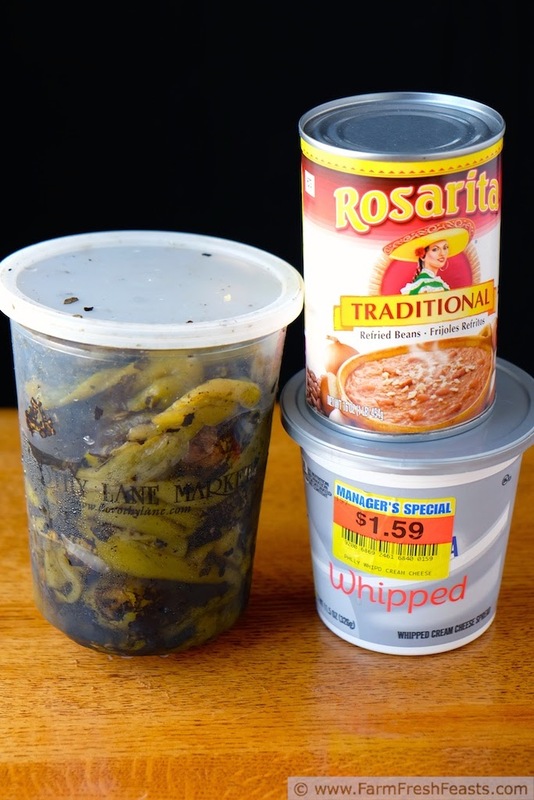 Looking around for inspiration, I grabbed a can of refried beans from the pantry [here's Kalyn's round up of slow cooker refried bean recipes for making your own], some cream cheese, and a couple more Hatch chiles. I get freshly roasted Hatch chiles from the grocery store a mile down the road. Yes, I MapMyWalk'd it so I can declare the mileage on my half marathon training log. 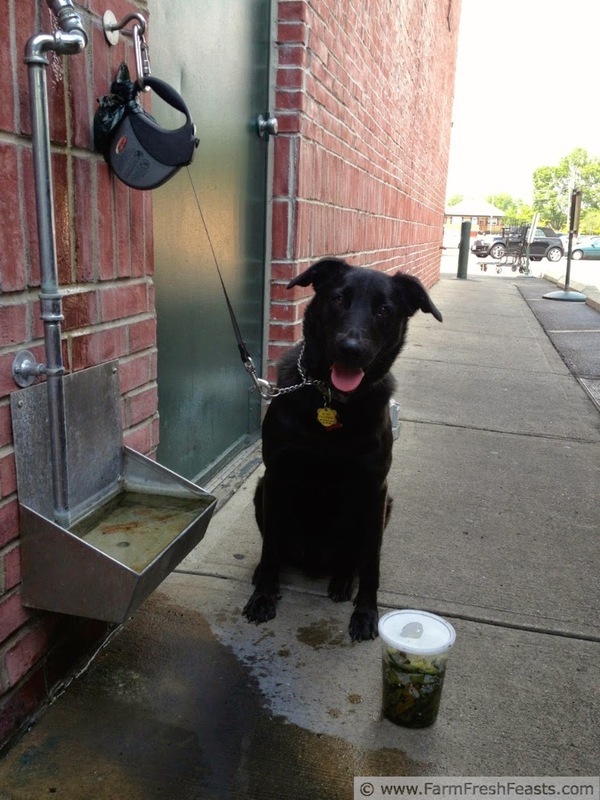 Simon is happy for the walk, and I love the flavor. I freeze individual chiles for use year round. If you don't have a source near you, a can of roasted green chiles would be a good substitute. 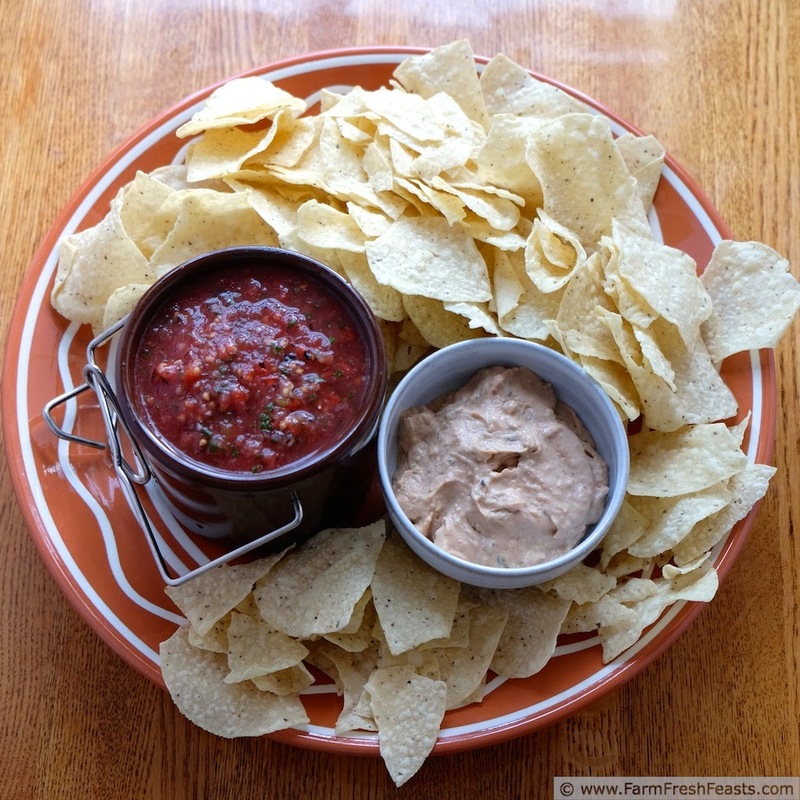 Since I had the food processor out from the salsa, I used it for this dip. I think an immersion blender or just a strong, patient, arm would work as well. 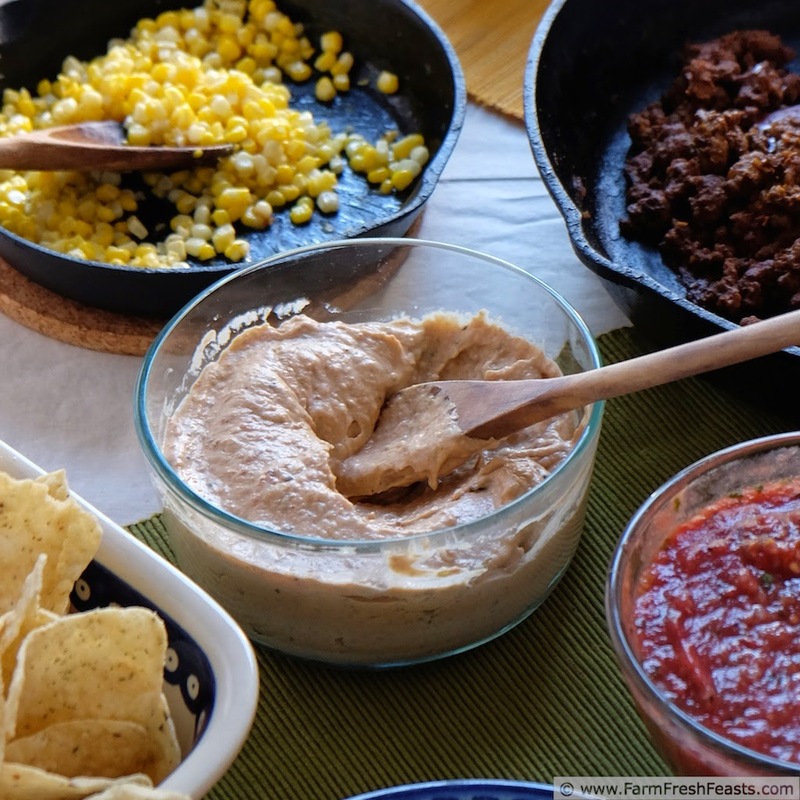 The result is a creamy dip with a nice kick, great served alongside chips & salsa or, as we'll see later in the season almost a year later, excellent as a base layer for a Make Your Own Taco Bar. Because even though last minute, 3 ingredient appetizers aren't my thing, making layered appetizers sure is. In a food processor or using an immersion blender, finely chop and blend the chiles with the cream cheese. Add the beans, and blend thoroughly. Serve. Yes, it's that easy and fast. 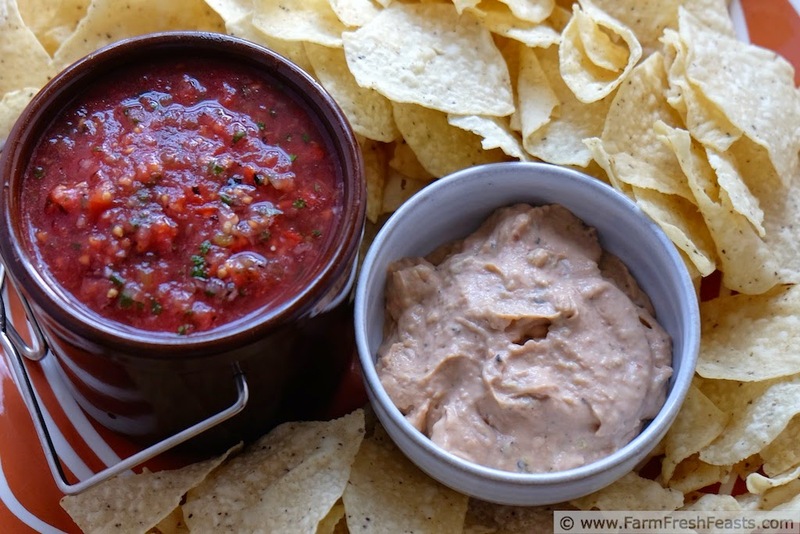 This keeps in the refrigerator a few days, and goes nicely with fresh salsa. 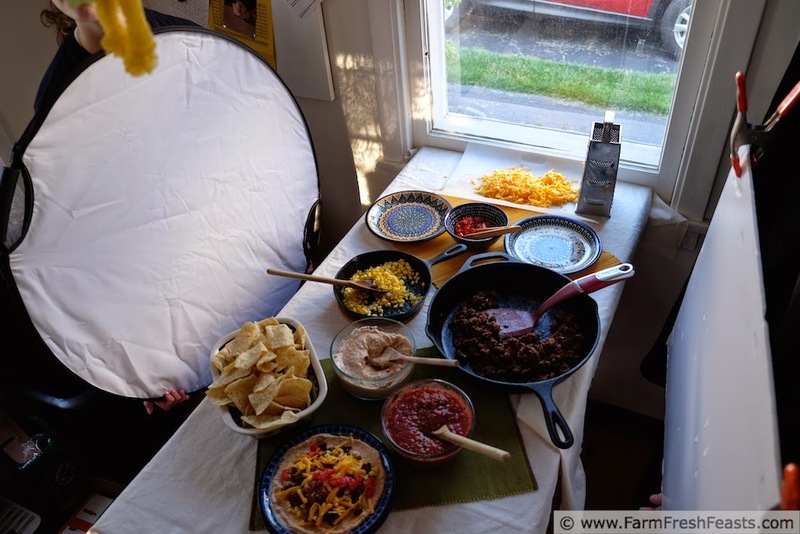 Behind the scenes: while learning to 'tell a story' with my food photos, I'm also learning to back light the photos (natural light from the window, reflected off the white things my hungry helpers are holding. This would be perfect as an appetizer for football season. And way better than the dip I used to make years ago using Hormel Chili in a can. It quite resembled dog food, which this doesn't. 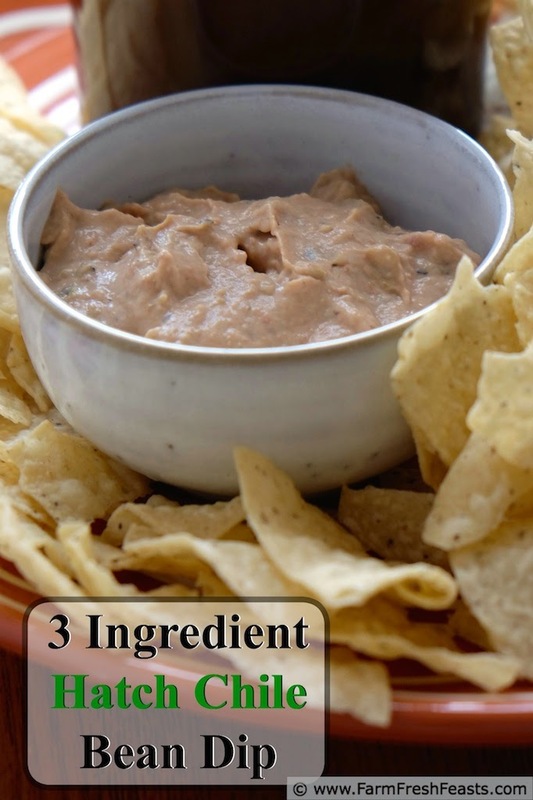 This sounds delicious and filling with the combination of cream cheese and refried beans. It's another one to put on the list to be sure. Now that you have your own Hatch chiles, you've got nothing stopping you! What's with the corn? These look delicious!! I absolutely LOVE Mexican food, could eat it every day. The corn--I'd set out an assortment of toppings so each of us could make our own layered taco dip plates for dinner. I had corn, taco meat, salsas, cheese, and of course this bean dip. yep, this sounds great - so easy! Easy is almost always a winner in my book. I can imagine digging into this with a pack of tortilla chips! Gorg!